Avant Window Navigator is a dock for the Free Desktop which shows your launchers and open applications. It also contains support for extensions, via plugins for third-party applications, which communicate with the dock with DBus, and via applets, which allows for workspace switchers, system trays, clocks, etc., to be embedded in the dock. These applets can be written in Vala, Python or C.
A lot of people have been using AWN (Avant Window Navigator) 0.4 for quite some time, but that was a beta version. Today the stable version of AWN 0.4 has been released, after 14 months since the last Avant Window Navigator release. Awn can be finally positioned on any edge of the screen. 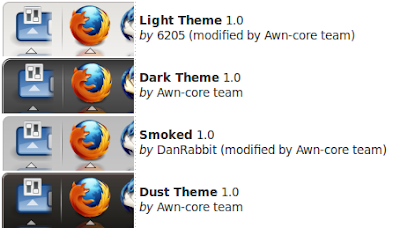 You can now pick among these background styles: Flat, Edgy, 3D, Curved, Floaty. Expanded mode (Awn will cover whole screen width). Autohide was completely revamped and Awn now supports Intellihide and Window Dodge modes. Lots of changes have been made to the applets too. To use this behavior, add the Quick Launcher Applet (via Filetools applets category), right click it and select "Preferences", then select "One icon with docklet" - which will turn AWN into multiple file browser icons when clicking the applet or "multiple icons" to always show the file browser icons. You can read a lot more about AWN 0.4 (as well as more screenshots) in our initial post on Avant Window Navigator 0.4 and the official announcement. sudo bash -c "echo 'deb http://ppa.launchpad.net/awn-testing/ppa/ubuntu ubuntu_version main' >> /etc/apt/sources.list"
I'm not sure if the 0.4 final version will be released in the above PPA or this stable AWN PPA, so be sure to also check the stable PPA if only want stable versions (but for now the stable PPA still has AWN 0.3.2). In case you don't know how to set up AWN Edgy mode, see THIS post.